The City of Guthrie was recognized by Oklahoma Forestry Services and the Oklahoma Urban and Community Forestry Council for achieving national certification from the Arbor Day Foundation. Communities, universities and utility companies can earn this special recognition by accomplishing specific criteria related to planting and caring for trees, woodlands and community forests. Guthrie was among 38 Oklahoma organizations recently honored at the state Arbor Week Kickoff celebration held at the Oklahoma History Center in Oklahoma City. Oklahoma celebrated Arbor Week March 24 – 30 this year. Communities can earn Tree City USA status by meeting core standards of sound community forestry management; maintaining a tree board; having a community tree ordinance and spending at minimum of two dollars per capita on community forestry activities and celebrating Arbor Week. Tree Campus USA designation is available to colleges and universities that effectively manage their campus trees; develop connectivity with the community beyond campus borders to foster healthy community forests and strive to engage their student population utilizing service-learning opportunities. The Tree Line USA program exists to recognize best practices in public and private utility arboriculture, demonstrating how trees and utilities can co-exist for the benefit of communities and citizens. 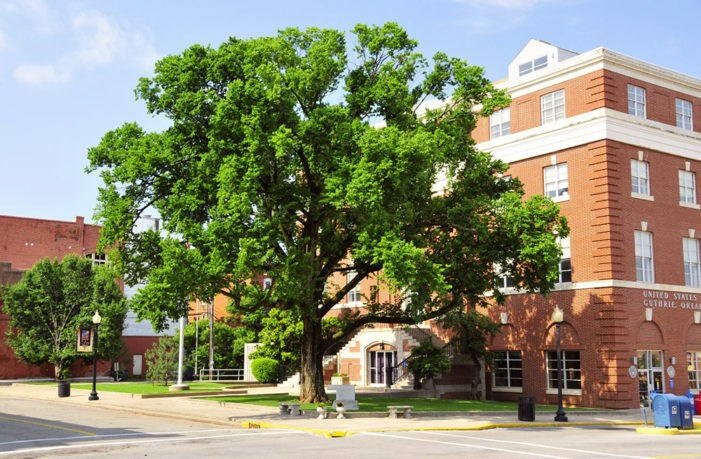 The City of Guthrie has achieved Tree City USA certification for 22 years by completing such projects as yearly tree trimming and maintenance in the Parks & Public areas around the City. Planting shade and fruit bearing trees for the community gardens. Participating in Arbor Week celebrations by enlisting the talents of Guthrie Elementary Schools to participate in poster contests and donating to Local Tree Bank Foundations.